I'm finally back from my travels, my injuries are healing up, and Scott's hiatus is over. All of this means that work can now commence! And by work I mean finally editing the second Awesome Jones book, finishing up and submitting new comic essays, and getting back to Star Trek: The Next Generation and blogging about it. Yesterday I watched Unnatural Selection and A Matter of Honor. Then I started up the next one and they were playing poker for the first time. Here were Pulaski, Geordi, O'Brien, Riker, and Data sitting around the table. I thought, "Wow, this is a bit of a watershed. What episode is this?" Guys, I even took a picture. Anyway, the episode ended up being Measure of a Man. THE Measure of a Man. Of course, I wrote about this episode during My (Actual) Year of Star Trek. A couple of years have gone by since then. At the time I'd been married for just over five years and now I'm coming up on my (omg!) ninth wedding anniversary. I moved twice. I wrote more books and started shifting my focus to comics. I watched as Scott started working in TV full time. I found out about my Aspergers and Ehlers Danlos. I sort of sucked at dealing with death. I lifted a bunch of weight. I ate a bunch of ice cream. I played a bunch of video games. I watched all of Voyager. I lived. Essentially, I humaned. I humaned the crap out of the last couple of years. I was humaning the best way that I could think to human. And, even though I'm kind of bad at various emotional things, I feel fairly certain I could pass Commander Maddox's requirements for sentience and he (probably) wouldn't dis-assemble me. Today, while watching Measure of a Man, I worked on fine tuning part of my latest comic essay. I drank coffee. I texted with my BFF who sent me pictures of the handouts she'd just got from a writing conference. I thought about how I need to clean the kitchen. Still, I put all of my daily human business on pause to really watch the last fifteen or so minutes. 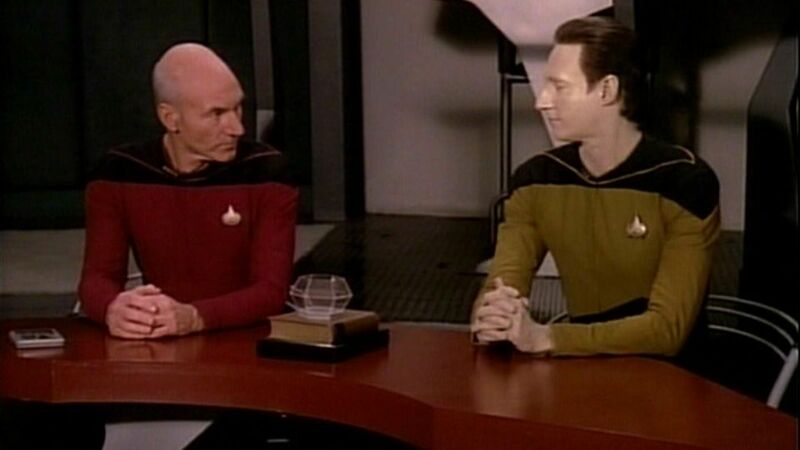 The trial of Data. I didn't cry. But I did smile. This episode is still, after all these years (after five more seasons of TNG, three more Trek series, several movies, a three movie reboot, and all the hope and anxiety that comes with the new series,) a beautiful, pretty much perfect example of what science fiction can and should do. In 2013 I said that if you only watch one episode of Star Trek, in your whole life, then Measure of a Man (even though it's still not my all-time favorite) might be that episode. I'm not backing down from that now. One more thing! If you haven't already entered my giveaway to win the new, anniversary edition of Boarding The Enterprise, go over and do that now! The winner will be announced on Monday! I love that although most of this one doesn't actually talk about the topic episode, it's still about the topic episode. You do this really well. Thank you, Tony! I appreciate that!